A Chinese tea egg (cháyèdàn) is a traditional snack food commonly sold by street vendors or in markets throughout Chinese communities. It’s a hard-cooked egg steeped with tea leaves and traditional Chinese spices, which adds a savory, slightly salty tone to a normally neutral flavored source of protein. The shell cracking method is an important feature in this recipe that not only lends to a beautiful design, but allows the tea and spices to seep into the egg white. The tea used for making tea eggs is usually high in dark-brown tannins. Pu-erh is commonly used, but it can be substituted with any black tea leaf. Green tea is often considered too bitter, but may be worth trying if you’d like to explore the effects of the marbling pattern from an entire color palate of organic loose leaf teas from Arbor Teas. Sieved over roasted fresh asparagus or a salad of spring greens. Press the eggs through a strainer, or grate on the finest facet of a box grater to create mimosa flower-like bits. Place the eggs in a medium-sized pot with enough cool water to cover by 1-inch. Bring the water to a boil, then lower heat to simmer for 3 minutes. Remove the eggs with a slotted spoon and place in a bowl of cool water. Reserve the simmering water in the pot for use in the next step of the recipe. When cool enough to handle, take the back of a spoon and gently crack the eggs evenly all around the shell. Take care when cracking to leave the shell intact. 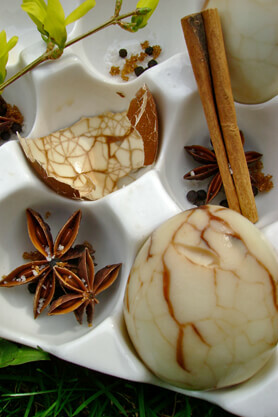 This allows the dark steeping liquid to seep into the egg white, staining it with a marbled design. The more you crack, the more intricate the design will be. Add the remaining ingredients to the pot of simmering water, stirring to combine. Return the cracked eggs to the pot as well. Bring the liquid to boil again, then reduce the heat to low and simmer for 40 minutes. Turn off the heat and cover the pot with a lid. Let the eggs steep for a few hours to overnight. The longer the eggs steep, the more intense the flavor and color will be. Drain the eggs, peel and serve. Unpeeled eggs can be refrigerated in a covered container for up to 4 days.